Some of the finest climbing and walking country in the Highlands is to be found within the 5,680 ha (14,035 a) in the Trust's care, in an area of dramatic landscapes and historical fact and legend. The infamous massacre of 1692 took place at many sites throughout the glen, but one of the main locations is just a short walk from the Trust's new Visitor Centre at Inverrigan. 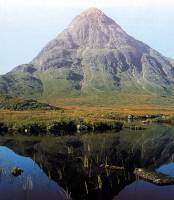 Geologically, the Glencoe hills are significant as an example of a volcano collapsing in on itself during a series of violent eruptions. This is also an area of international botanical importance, particularly for the woodlands and arctic alpine flora. In the lower part of Glen Coe the Trust owns a flock of sheep and fold of Highland cattle, part of a unique project to manage an area of internationally important grassland. The A82 Glasgow to Fort William road runs through this spectacular glen and the Visitor Centre is a perfect stopping place for the traveller going north or south. The Trust's new eco-friendly Visitor Centre houses fascinating exhibitions about the area, its human and natural history, the people who use and live near it, and the Trust's work in caring for Glencoe. Off A82, 17 miles south of Fort William.